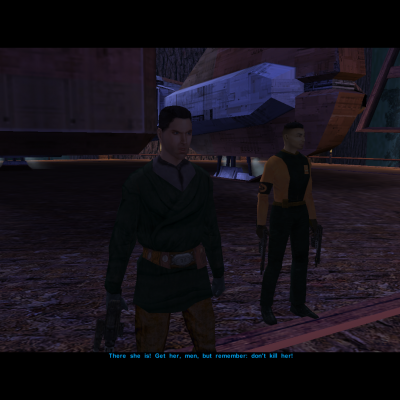 This mod restores the original appearance of the NPC Xor in the Xbox version of KotOR, by changing his species from a Twi'lek to a human. 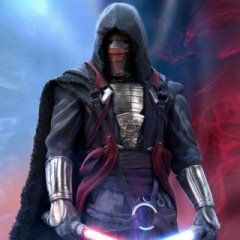 For those who do not know or remember, Xor appears during Juhani's personal quest, "Threat from Xor", and he is revealed to be the slaver who attempted to buy Juhani before Juhani was freed. I have always found it jarring that Xor openly makes anti-alien comments despite being a nonhuman himself ("You Jedi act all prim and proper, but inside you must feel the same way I do about the lesser, nonhuman species"), and in my opinion it would make far more sense for Xor to be a human. 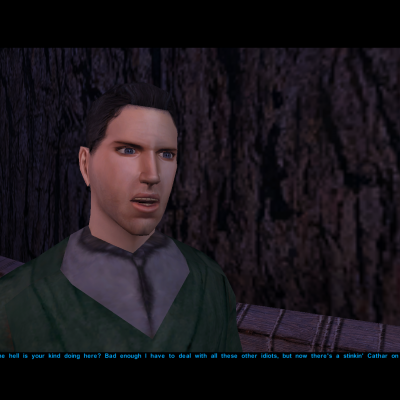 Later, I found out from Xor's Wookieepedia entry that he was originally a human in the Xbox version of KotOR, but his species was changed to a Twi'lek in the PC version. Therefore, I made this mod to restore Xor's original human appearance so it would be consistent with his in-game dialogue and anti-alien nature. Extract the Human Xor Restoration.zip you downloaded to anywhere you like, as long as it is not within the KoOR directory. Run Install Human Xor Restoration.exe, point the installer to your KotOR directory and let the installer do its magic. NOTE: If you already have the g_xor.utc and/or kas_xor1.utc file in your Override folder, when you install this mod a new folder named backup will be created by TSLPatcher in the same folder as the TSLPatcher. Do not delete the folder or the file within the folder if you are planning on uninstalling this mod. Delete g_xor.utc and kas_xor1.utc from your Override folder. If a backup folder was created when you installed this mod, go to the backup folder, cut and paste g_xor.utc and/or kas_xor1.utc from the folder and paste the file in your Override folder. This mod should be compatible with any other mods that do not change Xor's appearance. 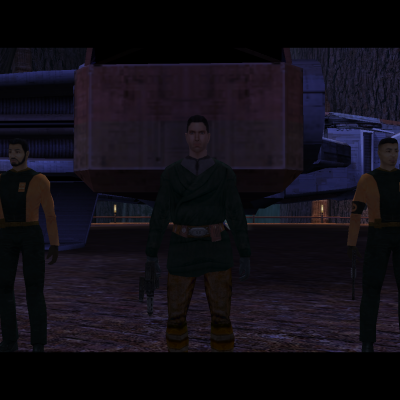 This mod is compatible with KotOR 1 Restoration (K1R). I played the game many times, but I never met him. What needs to be done to make Xor appear? Sorry fo my bad english. Tried it many times. Others appeared, but the Xor did not. I thought it was a bug. Like other party members, a general advice to progress Juhani's personal side quest is to talk to her every time you gain one level. 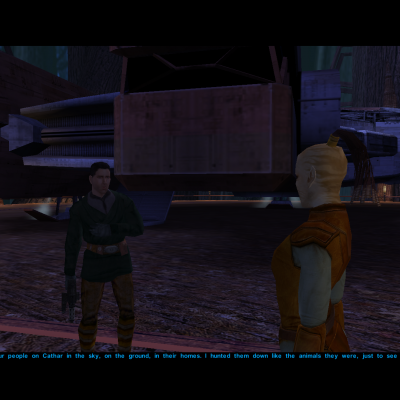 Once you progress Juhani's conversation to the point she talks about her being sold into slavery, have Juhani in your party and walk around the spaceport on Dantooine, Tatooine, Kashyyyk, Manaan or Korriban to make Xor appear. Although Juhani's romance was the main purpose of my guide, the conditions to progress Juhani's personal quest are the same regardless if you romance her or not. Tried it many times. I mean REALY MANY. Mods nothing to do with this, I do not have many. And withoun then it did not work. But thanks anyway. If you really have to try it in a new game because there are some bugs in the game that stops messengers like Xor from appearing. The infamous messengers bug is actually caused by triggering the "Threat from Xor" quest. My Juhani romance guide also covers that and provides solution to that bug. The only reason I can think of for Xor not appearing at all, is not talk to Juhani enough to progress Juhani's conversations far enough. 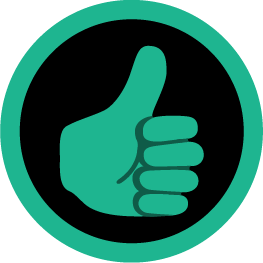 That said, I also strongly suggest anonim101 to start a completely new game for the best results. By this time my game is almost finished. Talk about buggy. So I end up on Tatooine and end up taking out wraid and Sand People and had my character level up then went to Korriban and he finally shows up. I find this leveling up and Xor appearing really annoying but it seems that's the only way he will spawn for me. Absolutely annoying. Thanks for making this. Xor should have stayed a human just like in the Xbox version, imo. Actually, according to the canon, Xor is supposed to be a Twi'lek. Apparently the Xbox version got it wrong. The campaign guide still confirms Xor was meant to be Twi'lek and that the Xbox version had an error. It happens unfortunately. Regardless, you're more than entitled to your belief. I even agree with you, but I'm OCD when it come to canon. Xor should have a unique appearance and not just a common generic one. SpaceAlex gave him one in his unfinished mod that I posted here. You might use that one. This mod is more specifically a restoration to restore his Xbox appearance for those who prefer vanilla style playthroughs with bug fix patches and K1R installed. Perhaps a modder can use SpaceAlex' head to make a standalone Xor "Enchantment" to visually make Xor appealing, thus creating a mod for restoration and a mod for visual effects.